Of the many different drift car models on the market, the HPI Sprint 2 drift car is one of the most phenomenal. This drift car is available for endless hours of fun and action for kids as well as adults, easily appeasing the needs of experienced racers as well as those who are new to the fun. Let’s take a look at the RTR HPI Sprint 2 drift car and learn why it is a top choice. One of the first details of this drift car that users enjoy is the waterproof design. Water, snow or sleet won’t stop this car from bringing you the non-stop, tire-shredding action that you seek. The Sprint 2 drift car is easy to operate, easy to drive and strong and durable. The sideways action adds even more fun to the package. This is a car you’ll love to race alongside the others, and with its lightning fast speeds, you can count on the winner being in your lane! Measuring 17-inches long, 5-inhces in height, a with a 7.9- inch width, this car is the perfect height and size for racing fun at its best. The drift car features a wheelbase of 10-inches, or 254 mm. Everything that you need to get started racing is included in the box. That is definitely a highlight that you will appreciate! This durable drift car can handle bumps and bruises so you never have to worry about damaging the vehicle. Take it to the track or take it outside, even to the kitchen floor. You’ll enjoy the durable design along with the awesome power this car has. It really moves quickly, just the way that you want it to move. The battery life on this drift car is amazing and you definitely will love the fact that it recharges in no time at all. The AC charger pack plugs into your outlet for quick charges. Want to do more with the drift car? You are the only thing holding it back, since there are many awesome upgrades available that allow you to totally customize the car to your exact specifications. In no time at all and with just a few accessories, you can create an awesome drift car that supersedes all of your wildest expectations. There is an instruction manual included with the HPI Sprint 2 drift car. This manual is very detailed, unlike what comes with some of the other cars out there. Take a look at this guide before you play, and you’ll be able to enjoy non-stop action the very first time the rubber meets the road. After reading his manual, the drift car is ready to be taken out of the box and enjoyed. It is ready to run with no assembly required. Of course, you’ll want to add your own features and upgrades as time goes along, but you can worry about that later down the line. For now, you can open the box and let the fun times roll down the race track! 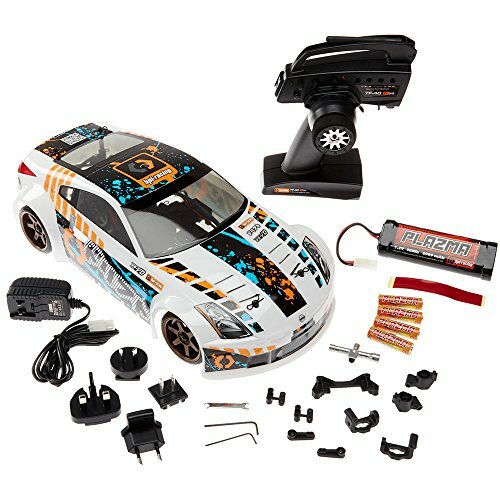 For the price, the HPI Sprint 2 drift car is a feature-filled car that will provide you endless hours of entertainment. It is strong, durable and made to last, even if it is a child who will be playing with the car. The drift car enables you to experience the most fun possible and you’ll never get tired of racing. And, with its awesome speeds, great endurance, and durability, you’ll never get tired of racing against the competition.